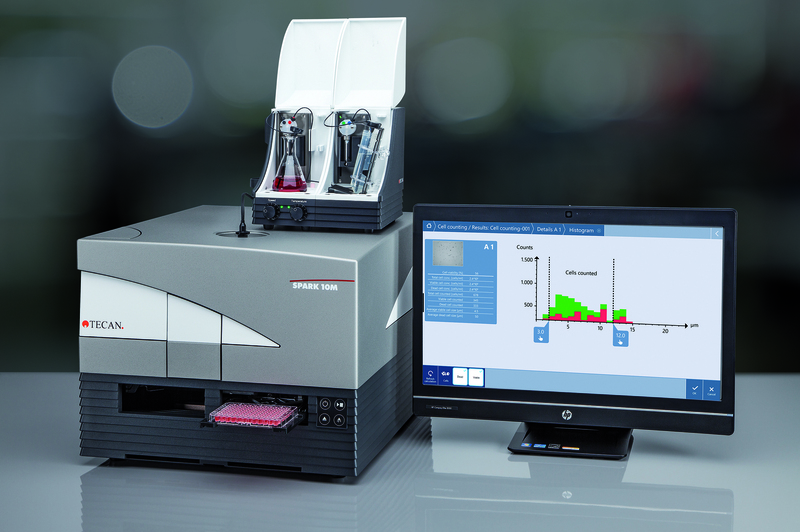 Tecan’s updated Spark reader combines the benefits of a multimode microplate reader and a bright field imaging system in a compact package. Spark lets users actually see what’s happening to their cells, offering automated cell imaging, confluence measurements, cell counting and viability assessments to simplify cell biology protocols and enable long-term, walkaway experiments. Spark has been developed specifically to address the needs of cell-based workflows, and incorporates a host of features – including precise regulation of temperature, gas partial pressures and humidity – to provide an incubator-like environment and maintain optimal assay conditions. The system’s Live Viewer function turns the user’s microplate reader into an automated microscope at the touch of a button, allowing them to instantly image and photograph defined positions in a microplate well. It offers bright field microscope-like functionality with 4x magnification and a user-definable focus, providing another way to perform fast and easy quality control of cells before starting an assay. In addition, Spark’s cell imaging module offers high throughput, label-free cell counting and one-click, trypan blue-based cell viability analysis using disposable Cell Chips. Spark also helps users to generate more reproducible cell-based assay data by allowing them to continuously monitor cell confluence within their microplate, and automatically inject a reagent once a user-defined confluence level is achieved. Along with with the system’s advanced Fusion Optics – which combines the flexibility of monochromators with the sensitivity of filters –there is a Spark configuration to match all users’ budget and workflow.